I recently began the process of Invisalign to straighten my teeth and I wanted to document my experiences step-by-step. Hopefully, this will help future patients feel comforted and become informed as to what is involved and what they can expect. Today, I had my complimentary Invisalign consultation. I wanted to find out if I was a candidate for the Invisalign process since I really did not want to get traditional braces. My upper teeth were mostly straight, however, my lower teeth have been extremely crooked (especially the lower front) since childhood. Being in my late 20’s, I really did not want to wear metal braces that are extremely visible. I work in marketing so I am dealing with patients in the office, and clients outside of the office, all of the time. It really was not practical for me to opt for metal braces. I never thought that I’d be a candidate for Invisalign until I began working in this dental office and spoke with the doctors about it. I met with Dr. Kenneth Anenberg, our Invisalign Specialist Dentist, and told him what I was unhappy about with my smile. He checked my bite and looked at my teeth with a mirror to see the occlusion. He talked to me about the benefits of Invisalign and what would be involved in the following visits. He told me that Invisalign is a series of clear aligners that slowly shift the teeth to become straight. In contrast to regular braces, the aligners are worn for approximately 22 hours a day, but can be removed during eating and to brush your teeth. I was also really surprised when Dr. Anenberg mentioned to me that Invisalign will also act as a night guard to help with my minor TMJ (tooth clenching which can cause jaw problems, and headaches) and tooth grinding (which can cause small cracks or worn down teeth). 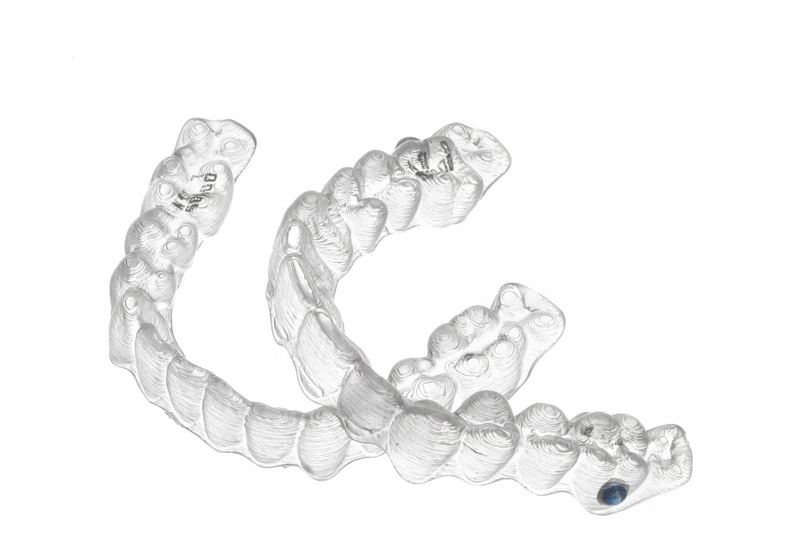 The clear aligners are also the perfect mechanism to use as whitening trays. All one has to do is place a whitening material (should be a professional dental peroxide) into the aligners for 30 minutes, twice a day. Then they can be rinsed out afterward and placed back in the mouth. After this initial consultation, Dr. Anenberg told me that for my next appointment I would need to have a full series or x-rays (18 films), a panorex (panoramic film x-ray of mouth), digital photos of my teeth (front, up-close, and profile), and impressions taken of my upper and lower teeth. Following my consultation, I was very excited to begin the process and be on my way toward straight teeth. I think that this is great for anyone who is a least 16 years of age who wants a clear alternative to traditional braces! Even many celebrities including Katherine Hiegl have used Invisalign to straighten their teeth. To read all the Invisalign posts go to our Invisalign Page or Dental Blog. For more information about Invisalign in Florida or to make an appointment with one of our Fort Lauderdale Cosmetic Dentists / Boca Raton Cosmetic Dentists, contact us today.